Buy Cheap Beretta 90 Two Spring Black Pistol | ReplicaAirguns.ca | New Website! Comments: The Beretta 90 Two is a spring-powered airsoft pistol that makes a great sidearm for intense airsoft wars. This gun has a full metal inner barrel with a lightweight plastic body for comfortable carrying in the battlefield. The gun features an integrated Weaver rail for attaching optional flashlights & laser dot sights, a 15 rd drop-free magazine, and a shot velocity of 260 fps. 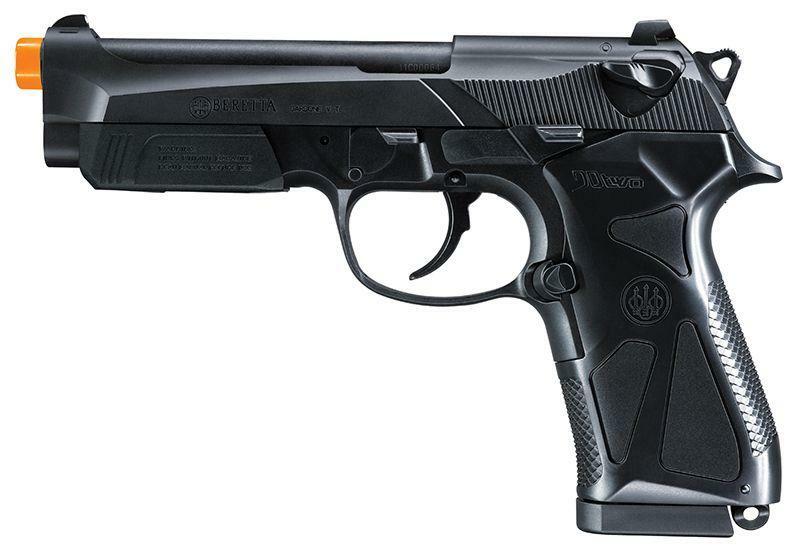 The spring mechanism of the Beretta 90 Two is simplistic, and overall this gun is extremely reliable and features very few breakable components. Airsoft enthusiasts who need an excellent skirmishing pistol with realistic looks should not miss this gun! Must be manually cocked for each shot.